Me: That awkward moment when you can’t remember where the ‘h’ in Gandhi goes. Friend: Joke or an insult? Me: Is it insulting to confess that I’m awkwardly undereducated? Friend: I know you are smart and sensitive. However, it’s only a six-letter word and I always find it hard to reckon with these. Maybe it’s inherent in our culture of unwillingness to learn? Me: Thank you for your earlier comments. I want to take this time to respond as thoughtfully as I can, with appreciation for your earnest encouragement toward more solemn discussion. To begin, I want to address the spirit of this status update, which is to gently poke fun at myself for tripping on something that should be universal knowledge. I believe I’ve appropriately fessed to my culpability, offering the kind of levity that I would afford someone guilty of a similar faux pas. I believe levity is called for, and the mistake itself an honest one. My intended tone is self-deprecating, not flippant. I will earnestly reflect on your hypothesis: That maybe Americans can’t spell Gandhi because we’re lazy about other cultures. I hesitate to make that leap. I agree that Americans can be ignorant about other countries and cultures in ways that other countries and cultures can’t afford to be with America. Still, we’d be guilty of fundamental attribution error by blaming inequities of knowledge (and inequities of curiosity) on individual Americans. Rather, the inequity reflects sociological patterns in choices we make as recipients of invisible privileges. In this case, the invisible privilege of nationality. Let’s pause immediate judgment. Some months ago, I griped to a friend, “I can’t believe how insensitive people can be about LGBTQ culture.” To which she responded, “I could say the same for how ignorant people are about what’s happening in North Korea.” As a woman, I’m often appalled by how male-dominated discourse characterizes the female body. These gripes are legitimate observations, and they often come from people who don’t have the privilege to be ignorant about that particular aspect of identity and experience. Our curiosity begins foremost from a curiosity about our Selves – what hurts Me, what inspires Me, what feeds My curiosity about who I am and what I can become. My context and identities greatly influence where and how far I explore. Influence what I want to discover, and what I am allowed to access. The point is, there are probably things you know – that you hold to be universal knowledge – that aren’t as universal as you believe they should be. And rest assured that somewhere out there, others are holding you accountable to some piece of knowledge you don’t share, appalled that you didn’t already know it. It’s not wrong to hold others accountable, knowing that I am myself culpable and ignorant in other ways. We are not responsible for being universally curious (an impossibility), but we are responsible for being widely receptive. For being humble in the face of all we don’t know, and having the decency to pay attention when someone kindly offers enlightenment. But I think – given the above, given the receptiveness of the learner – we should suspend judgment. We should suspend judgment because we live in glass houses. And most of all, we should suspend judgment because it’s the compassionate thing to do. There is a way to be compassionate, to hold each other accountable without condemning what they don’t know. To me, the greater question is: If they don’t know, are they now willing to know? And, in the quest to educate others, biting back judgment will go a long way in winning over their interest. I’m sure you’d want to be shown a similar kindness when the shoe is on the other foot and that foot is in your mouth. 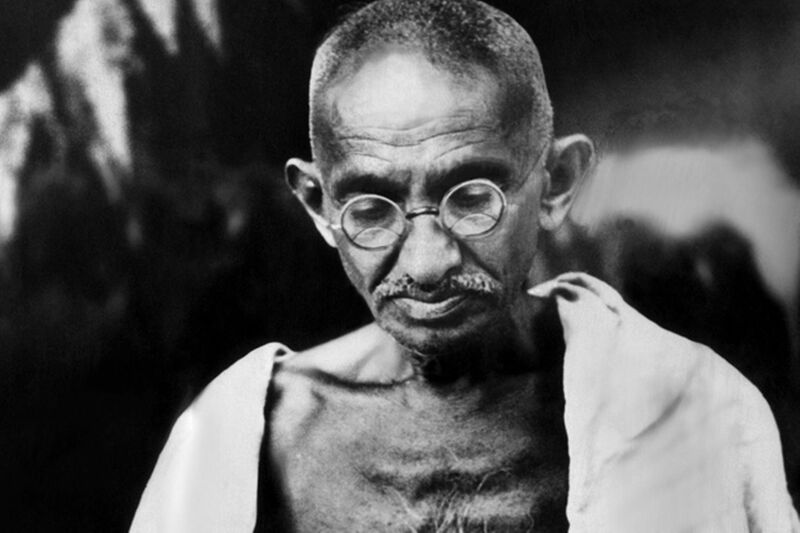 As for our specific topic: I hesitate to attribute the Gandhi misspelling to American ignorance, because I know several non-U.S. folks who struggle with it, too. For me, it’s a phonemic struggle. For others, who knows? Friend: I hope my comments did not come across as judgmental but rather a deeper manifestation of the global culture we are embedded into. I have deep respect for your insight and astuteness in general. My point was to simply poke fun at our collective amnesia and un-willingess to learn and gaze into deeper moral fabric of our value system. We are all culpable of self-aggrandization and rather vaporous attention to our own mortality. Thank you for a beautiful reflection. I’ve always loved your writings! Me: The Internet has its limits, so thank you for clarifying your intentions! I agree that it’s a work-in-progress for all of us. Thanks for nudging me to look under the rug and sincerely address issues tucked beneath the veneer of a simple joke.